This year’s food shortage is worse than usual. Usually when the harvests fail we rely on selling fruit that we collect from wild trees. This money can help us to buy food. But the trees were bare this year, especially the shea tree. The shea butter that women make usually helps fight food shortage, but it won’t be much help this year. Now women fetch firewood in the bush to be sold to middlemen from Bamako. You can see piles of wood in every corner of the village. This year it stopped raining before some of the crops were ready to be harvested. The ones that were almost ready didn’t have enough grain. No one had a good harvest in Gwelekoro. This is why I say this year’s food shortage is worse than usual, here and in many other surrounding villages. The government will distribute food this year. I heard that on Radio Benba, a local radio in Sanankoroba at about 15 km away. They said cereals will be given to the villages that need food. They didn’t name the villages, but I hope my village will be among them because the situation is critical here. Young people of 14 and 15 years old are leaving the village for the big cities. Some of those who go to school leave without informing their parents because they know they won’t be given permission to migrate. So far our village hasn’t received any help from the government or any other donors. All the village inhabitants are buying food from local markets. Some farmers have decided to save the grain they have harvested from their farms and buy food now before the prices rise in the rainy season (from July to September). Middle men drive the prices up very high during that period when people need food for working on their farms. Food shortages affect many other regions of Mali. It could be worse in the north of the country because of the Tuareg rebellion. We are worried by the rebels’ attacks even though we are not directly affected. The consequences of the rebellion could affect us if the rebels come to the south of the country. People are worried also about what could happen to the youngsters of the village who are soldiers and could fight with the national army against the rebels. People are worried because we heard on the radio that the rebels cut the throats of their victims and other atrocities. 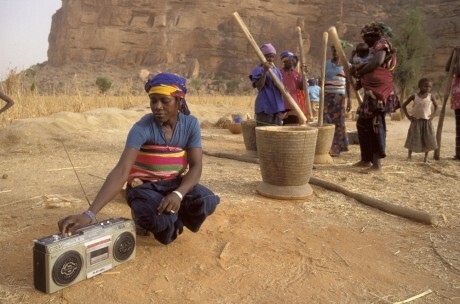 Radio is very important because it informs us about what is happening out of our village. I learned many things thank to a radio receiver I was given during training organised by an NGO named ADEC, based in the village of Welessebougou (about 40km away). During the training they asked us how we get informed and transmit messages. Many trainees said they send letters, use messengers or the telephone if possible. The trainers explained how important the radio is when we have to inform many people about something. At the end of training they gave each trainee a solar radio receiver. Children broken the solar panel of the receiver I got but it also has a handle we can turn round to make it run so I don’t always have to buy batteries.